One study showed that flowers should be harvested when they are about 80% open while another study showed that 2-4 flowers should be open. The more flowers that are open at time of harvest, the more the flower food uptake which can improve total flower vaselife. Flowers with large stems last longer than those with smaller stems. Member of the Agavaceae (agave family). Some common relatives include century plant, yucca, dracaena, New Zealand flax, pony tail and agave. Waxy, tubular flowers, 1-2 inches long, occur in pairs, up to 30 flowers in a spike at the ends of the stems. Usually marketed as entire stems but individual flowers are sometimes utilized in a similar fashion as Stephanotis. Stems are 24-36 inches long. Plant is a herbaceous perennial from tuberous roots, classed as a monocotyledon, leaves often lighter green in color. Flowers have a very sweet, intense, gardenia-like fragrance. Some data suggests 39-41 F for up to 7 days. However, Reid and Evans (1994) and Reid (1996) showed that storage for only three days can reduce vaselife and number of florets opening by 30-50%. However, if flowers are pulsed with a 20% sugar solution for 24 hours at room temperature before being placed in storage then the negative effects of cold storage can be overcome. Wet or dry storage produced equal results. In short, sugar-pulsed flowers can be stored at 34-36F for 6 days with good quality flowers being the result (~10 days vaselife). From the Greek “polis” (gray) and “anthos” (flower). The specific epithet name tuberosa refers to its underground storage structures (tubers). 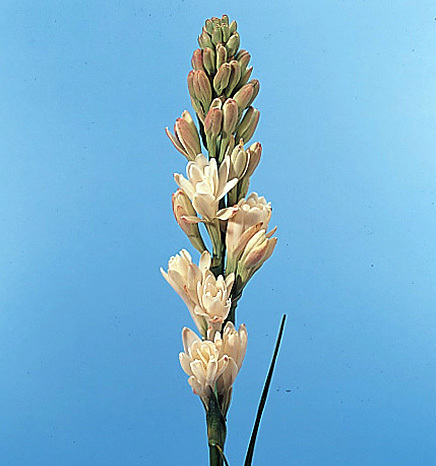 Tuberose has been cultivated since the 16th century and is an essential ingredient for the perfume industry. The agave family is important for fiber. Single and double flower forms are available. Some references recommend removing the top buds from the spike to reduce stem curvature and promote maximum flower opening.